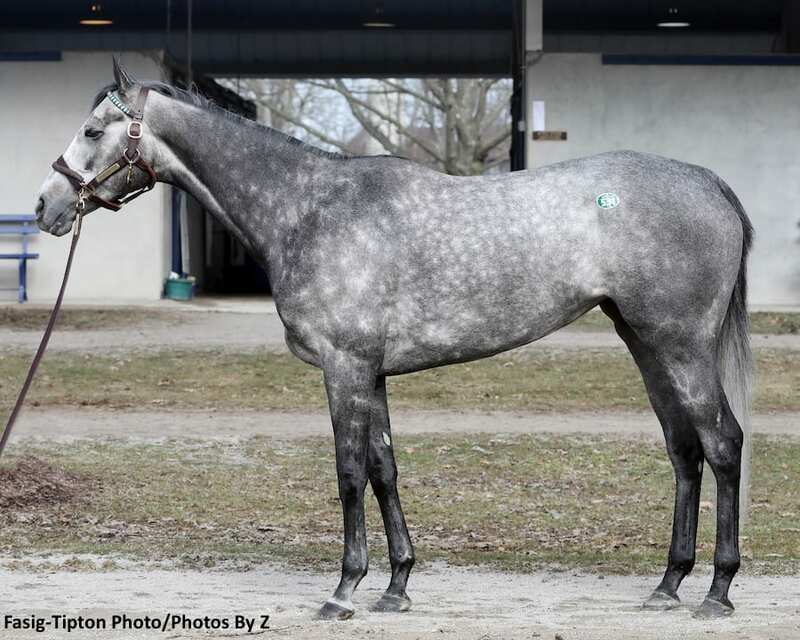 Hip 531, La Manta Gris, brought $285,000 to lead Tuesday's session at the Fasig-Tipton Kentucky Winter Mixed Sale. The North American mixed sale calendar closed on a high note Tuesday, with the Fasig-Tipton Kentucky Winter posting gains in average and median sale price. The two-day auction finished with 327 horses sold for revenues of $9,659,400, down 7 percent from last year's sale when 364 offerings brought $10,436,800. Growth was seen in the marketplace in the average price, up 3 percent to $29,539, and the median, which rose 43 percent to $15,000. The cumulative buyback rate finished at 20 percent compared with 23 percent in 2018. Monday's opening session produced the highest-priced offerings in both the breeding stock and yearling portions of the catalog. Cheekaboo, a Grade 2-winning Unusual Heat mare, sold to K R Japan for $300,000 to top the overall sale, while Irish Meadow Stable bought a yearling Into Mischief filly for $200,000. However, Fasig-Tipton president Boyd Browning said he was pleased with the level of trade seen from the first horse in the ring to the last horse that left it. “It's kind of amazing to be standing in the back ring, and the last horses are walking through the ring in the February sale, and people are saying, 'Can you bring some more in here? '” he said. “A common complaint I heard from consignors was they wished they had more horses in the sale, because it was a very solid, strong marketplace throughout. David Ingordo, signing under the pseudonym “Jacques Sparrow Bloodstock,” landed Hip 531, the broodmare prospect La Manta Gris for $285,000 to top Tuesday's session and reach the sale's second-highest overall price. La Manta Gris is a 5-year-old Lemon Drop Kid mare out of the winning Lasting Approval mare Quiero Ganar. Racing for the Blackstone River Stable operation of Minnesota Twins manager Rocco Baldelli, the mare won three of 18 starts for earnings of $211,362. She earned placings in the Dueling Grounds Oaks at Kentucky Downs and the Keertana Overnight Stakes at Churchill Downs, and she most recently ran in the G2 La Prevoyante Stakes at Gulfstream Park on Jan. 26, ten days before she sold. Ingordo was familiar with what the mare had to offer, having signed the $130,000 ticket for La Manta Gris on behalf of Baldelli at the 2016 Ocala Breeders' Sales Co. March Sale of 2-Year-Olds In Training. He also works as bloodstock agent for Lane's End, which consigned La Manta Gris at the Fasig-Tipton sale, and he said the new addition would join the farm's broodmare band. Potential partners for her first mating included Lane's End stallions Quality Road and City of Light. Second dam Cuando Quiere is the catalyst for the page of La Manta Gris, serving as the pivot point for runners including G1 winner Honey Ryder, G2 winner Dominus, and G3 winners Cuando Puede and Hit It Rich. The session's leading yearling was Hip 334, a Palace colt who sold to Billy Williams for $75,000. The New York-bred colt is the second foal out of the unplaced Forefathers mare Silk's Diamond, from the family of Irish champion Godswalk, Argentine champion Handsome Halo, and G1 winner Costume. Endeavor Farm consigned the colt, as agent. Tuesday's session marked a slight tap on the brakes compared with both the first session of this year's sale, and the second day of last year's auction. A total of 181 horses sold for $4,982,200 on Tuesday, down 21 percent from last year's closing session when 183 horses brought $6,302,600. The average sale price declined 20 percent to $27,526, the median went unchanged at $13,000, and the buyback rate finished at 11 percent. To view the auction's full results, click here. This entry was posted in Bloodstock, NL List and tagged Blackstone River Stables, boyd browning, David Ingordo, endeavor farm, fasig-tipton, fasig-tipton kentucky winter mixed sale, horse auctions, La Manta Gris, Lane's End, Palace, Rocco Baldelli, Silk's Diamond by Joe Nevills. Bookmark the permalink.